It's always fun to have a watch that comes with a story. Sometimes, the story derives from our own experience -- we receive the watch to mark a special occasion or we have a "war story" from our purchasing or acquiring the watch. Other times, we have a watch that tells someone else's story, as we see the name of a stranger engraved on the back of an old watch. Sometimes these strangers can be mysterious -- as we read the inscription we might visualize a couple on their wedding day or proud parents presenting their son with a watch, as he graduated from medical school. The triple calendar, three register chronograph shown below presents a different kind of story. It is a beautiful chronograph, in 18 karat gold, with raised gold figures on the dial -- the single most expensive model shown in Heuer's 1946 catalog. What makes this one interesting, however, are the inscription on the case-back and the papers that remain with the watch, 60 years later. We are left to wonder about the person who purchased this watch, in Basel in the Spring of 1946. The Reference 2558 chronograph is a triple calendar (day-date-month), three register chronograph, in 18 karat gold. This sample is the "top of the line" model, with raised gold figures on the dial. The dial is not white or silver, but more of a cream color; the gold dauphine hands show that nothing has been spared in the execution of this model. The engraving on the case-back shows us that this watch was purchased by a Mike Levin, in Basel in 1946. This is an elaborate style of engraving, fitting for a watch of this quality. Shown below is the original guarantee that was issued with this watch and which remains with the watch today. E. Linn was the jeweler who sold the watch to Mr. Levin, and issued the guarantee. The serial number for the watch (62823) watches the number inside the case-back. The number for the guarantee was likely the jeweler's own reference number. We see that Mr. Levin was a soldier, showing his address simply as "U. S. Army". 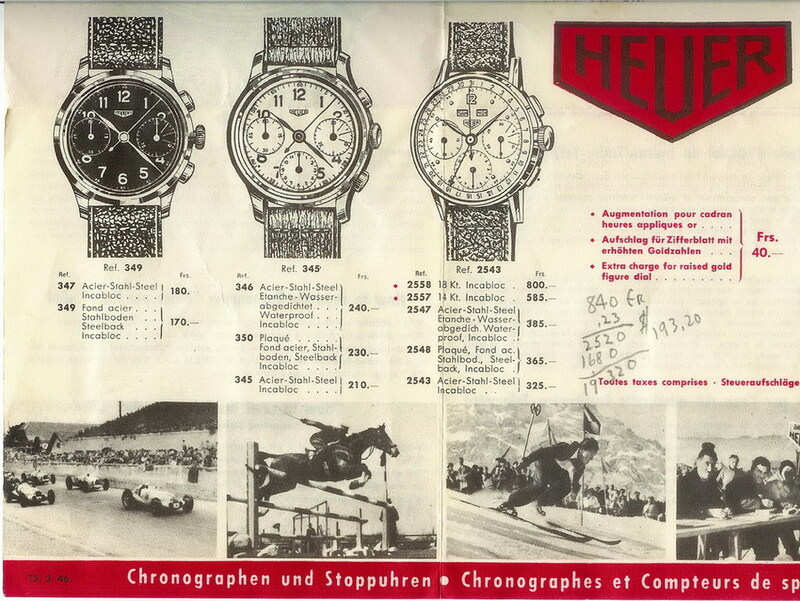 The last item with the watch is a copy of Heuer's 1946 brochure. Notice the handwritten notes -- likely Mr. Levin's computation showing the purchase price of the watch (840 French Francs) converted into U.S. Dollars ($193.20). This catalog was printed March 15, 1946. And so we are left with our watch, with the "Basel 1946" engraving, and questions about the circumstances of the original owner and his purchase. Was "Mike" a nickname for "Meyer", or were Mike and Meyer two different people? Was the soldier (Meyer) purchasing for his son (Mike) or another relative? How was a soldier purchasing Heuer's most expensive chronograph, for 840 Francs, the year after the end of WWII? Was he celebrating a promotion or decoration for service during the War? These are just a few of the questions as we see this beautiful watch and wonder about it's "story".